Naples, Napoli in Italian, is the third most-populated city in Italy and the biggest city in Southern Italy. Its name comes from the Greek Neapolis meaning new city. Its close proximity to many interesting sites, such as Pompeii and the Bay of Naples, makes it a good base for exploring the area. 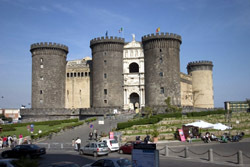 Naples is a lively and vibrant city, full of wonderful historical and artistic treasures and narrow, winding streets with small shops, making it worth at least a few days visit. Vesuvius is an extremely fascinating volcano and it is certainly the symbol and the main feature in the Neapolitan landscape. Over the centuries it has been the cause of destruction of entire cities. 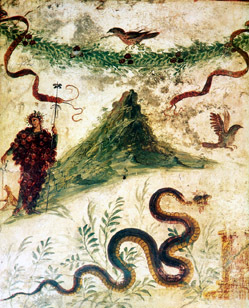 Vesuvius' fame dates back to the tragic eruption in 79 AD. which destroyed the towns of Pompeii, Herculaneum and Stabiae. Vesuvius' last eruption was in 1944 shortly after the allied troops landed in Salerno. Today the volcano is considered quiescent, or dormant, but the vents or fumaroles on top remind us of what lies beneath. The walk up to the summit is beautiful, and from there You can enjoy a panoramic views of all the area. 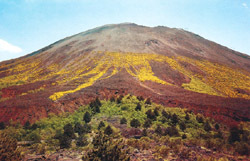 While all around the volcano, the mild climate and the extremely fertile ground, despite the lava flows that have followed one another over the centuries, have enabled the evolution of luxuriant characteristic flora that provides a habitat for a few, but significant animal species, with birds that stop here while migrating. 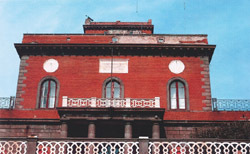 THIS PRIVATE GUIDED TOUR OF NAPLES AND VESUVIUS COSTS EUROS 220.